Here are a couple of tools that I've brought up before in other posts, but thought it was worth bringing them up again. The first is a learning tool and the second is a mixing tool. If your mixes aren't what you think they should be, or you're confused about how to get started, here's a video mixing course that I recently did for Lynda.com that will teach you the fundamentals of getting a strong, punchy mix regardless of the type of music. The course covers every aspect of mixing, from setting up your listening environment, to setting up your mix, to how and when to use EQ, compression and effects, to the best way to balance a mix. There are over a hundred movies that describe every step of process of creating a mix, and you can see the full list here. Lynda.com is one of the oldest online training portals and their production values are incredibly high. They have over 1500 courses in every type of software you can think of. The cost is $25 a month for as much as you can view, but click on this link for a free 7 day trial. Here's a sample of a movie from the Audio Mixing Bootcamp course about setting up a compressor. 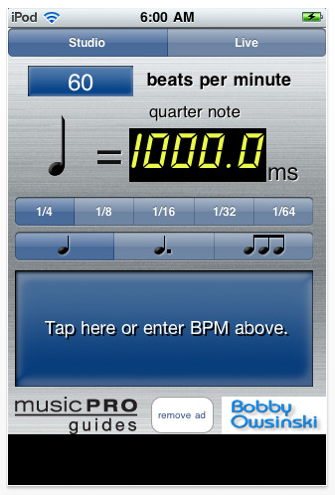 About a year ago one of my publishers, Hal Leonard, asked me if I'd be interested in doing a phone app. If I was going to do one, I wanted it to be something that I would use myself, all the time, so I came up with the Delay Genie. The Delay Genie basically replaces those time delay charts that most studios used to have so you could easily set the reverb predelay and delay times when you're mixing. While most delay plugins allow you to do some form of automatic timing, the Delay Genie is different because it will allow you to easily calculate dotted notes and triplets, which are time denominations that are essential to a good mix and one of the tricks of most top mixers (see this recent post). As a bonus, in the Live mode, the app also calculates the delay time from the stage to a delay speaker stack in a live sound reinforcement situation. Give it a shot and let me know what you think. It's now available in the Apple iTunes App Store. 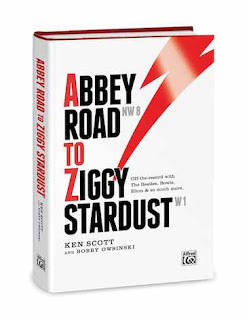 The release of legendary engineer/producer Ken Scott's memoir, entitled Abbey Road To Ziggy Stardust, is coming up soon on June 6, so I thought this was a good time for another excerpt. This one is from the first Supertramp chapter (there are 3) that outlines some of the unique recording methods used on their breakthrough album Crime of the Century. "One way of looking at how I approached Crime was that it started as Google Earth. I knew the overall shape of it, and as we went along it became more like the Street View as we slowly saw every nook and cranny. The fact was that I was actually bored with recording. I’d recorded drums, guitars, tambourines and everything else you can imagine so many bloody times and it was always the same. Since we were going all out on this record, I decided that we should try to make it as different as we can. I threw that concept at the band, and they just ran with the idea. Like with the sound effects. Most times when sound effects were used on records back then, the engineer would go to the closet that had the sound effects records or tapes, and that’s what he’d use. Everyone used the same ones. I insisted, “If we’re going to do it, we’re going to do it properly and record our own, exactly like a movie,” so we rented a stereo Nagra portable recorder and recorded all of our own sound effects. For example, for the song “School”, I went down to a friends house that was two doors down from where my three daughters were going to school, just in time for the lunch break because I knew the kids would be out in the yard playing. I recorded for a half hour, then went off to the studio. Roger would then listen on headphones to try to find bits that might actually work in the song, and we’d go through it and finalize what we were going to use. For percussion we tried to use different things that weren’t typical percussion instruments. On “Dreamer” there’s a part that under normal circumstances would have been a tambourine, but that would’ve made it so ordinary. In trying to get something different, I had the idea of getting Rick [Davies] to shake a pair of drum brushes. He started off doing it rather heavily, but all you could hear was a whistle from them. We got him to slow it down a bit and do it with more wrist than arm action and suddenly we got the effect that we wanted. There’s a kind of whistle there at the same time as the brushes go through the air, which makes it sound totally different than anything you’d expect but still fills the rhythmic need. Probably one of the best examples of teamwork was when recording some tom overdubs, also on “Hide In Your Shell.” We wanted to get a change in pitch on each tom hit, so every time Bob [Siebenberg, Supertramp's drummer] hit a tom I changed the varispeed, speeding the tape up and then bringing it back to normal. When played back this makes the tom's pitch go down and then as it tails off it goes back up to normal. Bob had to hit the tom on beat with the tempo going all over the place, a feat he accomplished admirably as can be heard on the final product. Everything but the kitchen sink went into this recording. Actually we got pretty close to a kitchen sink as well. The session percussionist extraordinaire and all around nice guy Ray Cooper had once told me of something which apparently was used a lot in horror movies - a water gong. You take a gong, hit it and then gradually lower it into water. This creates a strange, eery effect because as the gong is immersed the water makes its pitch change. We were working on the ending of “Crime of the Century” and for those that don’t know, “Crime” is in two parts. There’s the song and then it goes into a seemingly endless piano part during which it builds and builds with different instruments and lines coming and going throughout. We were at the point where the drums came in and we needed something to point out that something big was about to happen. Enter the water gong. Now that name is slightly incorrect because it ended up that we didn’t actually use a gong; we used a piece of sheet metal instead, but it worked just as well. We rented a large fish tank and filled it with water and, at the appropriate time, Bob struck it and lowered it into the water, and it sounded amazing. What’s great is that if you hear it on its own with no other instruments and without any reverb, you actually hear the water bubbling. So cool. That effect actually became a pet thing for me as I used it in one form or another on a number of future albums as well. A word of warning however; the filling of the fish tank is slow but fairly easy to accomplish, one bucket of water at a time. But, once you’ve finished the recording you’re left with one hell of a heavy fish tank to empty and so you have to have a fair number of pretty hefty guys to get it to the kitchen or bathroom sink to empty it. We went completely overboard on everything, which is why the album took close to six months, a very long time for an album back then. Once we were given that crucial go-ahead from the label, we had no real choice but to strive for perfection." 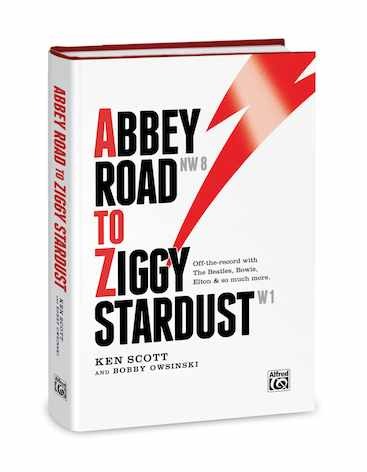 For more details on what's in the book and to pre-order it, go to abbeytoziggy.com. For more info on Ken, go to Ken-Scott.com. Here's a song analysis of "Holocene" from the self-titled Bon Iver album, a band that won the Grammy for best new artist earlier in the year. "Holocene" was mentioned as one of the best songs of 2011 by a number of music magazines and was also nominated for a song of the year Grammy. The song was recorded and mixed by leader Justin Vernon at April Bay Studios, which was a remodeled veteranarians clinic in Fall Creek, Wisconsin. As with all song analysis, we'll look at the song from, the arrangement, the sound and the production. As with virtually all hit songs, this one works because of the tension and release brought about by the arrangement of the song rather than its form. It's lyrical content is also strong, discussing personal self-worth as well as describing the Wisconsin countryside. Unlike many songs, "Holocene" has a hard ending after the chorus. This is a very thick song in that there's a lot that's going on, yet it's kept interesting because of the introduction and exit of various instruments. For instance, the song begins with two acoustic guitars panned left and right, then is joined with what sounds to be like a 12 string, and half-way into the intro it builds to a false peak with the entrance of a slide guitar (maybe it's a steel guitar - hard to tell) and vibes. On the first chorus, the bass, hand claps, and what sounds like an electric piano enter, and the acoustic guitar on the left becomes an electric. On the 2nd verse, a snare drum and high hat appears on the left with another snare playing a slightly different figure on the right, along with a keyboard pad and a vibes-like sounds. During the second chorus, the bass becomes more active and an additional keyboard pad enters. The 3rd verse opens with just the lead vocal by itself (there are additional harmony parts singing the melody throughout the song otherwise), along with two different horn loops panned left and right in the background, along with the acoustic guitars attenuated so they're just barely heard. As the verse progresses the pad, snare and guitars are gradually brought up in level until they peak just before the chorus. Then on the 3rd and last chorus, what sounds like an arpeggiated string sound, the harmony vocals, and a new pad enter, building the song to a peak. As you can hear, the dynamics of the song are constantly altered by instruments entering and exiting the song, creating interest via tension and release. The arrangement elements of "Holocene" are very different from most other modern songs in that the traditional rhythm section of bass and drums is replaced with the acoustic guitars instead, while the rhythm (the instruments that provide motion to the song) comes from the claps and snare drums as well as the acoustic guitars. The sound of "Holocene" is pretty interesting in that there are a lot of stereo instruments and doubles, but they're not traditional at all. In most cases, instead of playing the same thing both times for a double, the second one is slightly different, giving the stereo part a moving effect. This is what happens with the acoustic guitars, the snare drums (with one played with a high hat on the left side and a naked snare on the right), and the horn loops in the third verse. The lead vocals are doubled traditionally, and panned left and right as normal. You can't really hear the effects well, but there's a medium length reverb on most elements and what sounds like a very long delay on the horn loops in the last chorus. The song is compressed, but it's not noticeable and breathes pretty well while subtly staying in your face. The production on "Holocene" is beautiful by the way it creates a mood to accompany the lyrics and melody. As one of the comments on YouTube said, "It makes me happy and sad at the same time." The mix elements aren't made to be heard as instruments as much as individual elements of a mood. It's sometimes hard to pinpoint exactly what instruments you're actually hearing, but that's not important because it's more about how they make you feel. The vocals are interesting in that there's a 3 part harmony on the melody throughout most of the song, but the harmony is way in the back of the mix so it doesn't call attention to itself. Then the way the mix elements are gradually faded into the mix on the 3rd verse almost makes it sound like a bridge while adding a peak to the song. While the sound of the song is a little on the dark side without a lot of definition, that's all part of setting the mood. It's the perfect match for the song, which is why so many people love it. I recently wrote a blog about the passion of audiophiles and how important that is in today's MP3/earbud world. Passion shouldn't be confused with foolishness, however, and sometimes an audiophile can be easily pushed over the edge of gullibility by fantastic claims from a manufacturer. I'm not sure if some manufacturers are blatantly trying to rip off some poor guy with too much money (audiophiles are almost always guys), or if they actually believe their own hype. As far as rip-offs, this one takes the cake. It's a wooden volume knob for $485 from Silver Rock that supposedly dampens the "micro vibrations created by volume pots and knobs that find their way into the signal path and cause degradation." Take a look at the advertising copy. "Dynamics are better and overall naturalness is improved. Here is a test for all you Silver Rock owners. Try removing the bakelite knobs and listen. You will be shocked by this! The signature knobs will have an even greater effect…really amazing! The point here is the micro vibrations created by the volume pots and knobs find their way into the delicate signal path and cause degradation (Bad vibrations equal bad sound). With the signature knobs micro vibrations from the C37 concept of wood, bronze and the lacquer itself compensate for the volume pots and provide (Good Vibrations) our ear/brain combination like to hear…way better sound!!" Now to be fair, I couldn't find the actual website for the above as the link now provides an error message, but there's a lot of references to it around the Web so it appears not to be a fake or an April Fool's joke. With all the bad press, Silver Rock probably decided it was best to keep this one as a personal request product only. 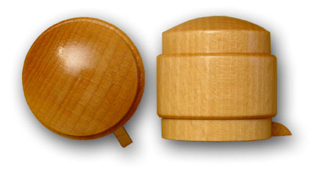 If anyone really wants one though, I can get you a wooden knob that performs way better for only $250. With all of the mumbo jumbo that some manufacturers pour out about the analog world, I can only image what they say about the digital one, where it seems a lot easier to do nothing except psychologically imply that some big improvement is happening. Anyone have any examples? The Latest On "Mastered For iTunes"
On Friday I had the pleasure of sitting in on a meeting with 3 representatives from Apple at Oasis Mastering, as they briefed us on the latest info on the new "Mastered for iTunes" program. While there's already some info on the program currently available, it was good to finally get the most up-to-date details directly from the source. Here's the gist of the program. 1) iTunes now prefers that you supply the master audio files at 96kHz/24 bit, but any sample rate that's a 24 bit file will still be considered "Mastered for iTunes." Music files that are supplied this way will have a "Mastered for iTunes" icon (like on the left) placed beside them to identify them as such. The reason why they're asking for 96/24 is so they can both start with the highest resolution source material for a better encode, but also for a bit of future proofing in the event that iTunes later converts to a better format or a higher encode resolution (it's now 256kbs, but more on this in a second). 2) "Mastered for iTunes" doesn't mean that the mastering facility does anything special to the master except to check what it will sound like before they (or the record label) submit it to iTunes, and then check it later once again. All encoding for iTunes is still done by Apple, not by the mastering houses, record labels, or artists. 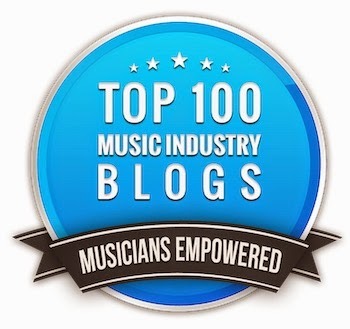 The reason for this is to keep the encodes consistent and to prevent anyone from gaming the system by hacking the encoder, but also to avoid any potential legal problems that might occur when a mastering house sends the files directly to iTunes instead of the label without their permission, or uses different specs, etc. 3) As stated above, the mastering house doesn't do any encoding directly, but Apple has provided a number of tools that they can use to hear what the final product will sound like when it's encoded. That way they can make any adjustments to the master to ensure a good encode. One unique aspect of "Mastered for iTunes" is something that's not been publicized called a "test pressing." When Apple finally encodes the file, they'll send a copy back to the label/engineer/artist to check. If they sign off on it, the song then goes on sale in the iTunes store. Of the few mastering houses that are currently participating in the program (all of the major ones), it was surprising that most of the time a test pressing was rejected not because of the audio quality, but because it was the wrong master. Yes, as record companies seem to do, someone would actually send the un-mastered file or a completely different song or version. Luckily, the problem is now able to be caught in the test pressing stage. 4) Speaking of the sound quality, iTunes is now using a completely new AAC encoder with a brand new algorithm and the sound quality it produces is stunning. If provides an excellent encode if you use a few common sense guidelines (more on this in a bit), and if you do, the result is almost impossible to hear (at least on the music we listened to). I mean, there we were, mastering engineers Eddy Schreyer, Gene Grimaldi plus myself, listening in this fantastic listening environment, and we literally couldn't tell between the source and the encode most of the time. Now there were some where we could hear the difference too, but it wasn't that big a difference and certainly didn't sound anywhere near as bad as the typical MP3. a) Turn it down a bit. A song that's flat-lined at -.1dBFS isn't going to encode as well as something with some headroom. This is because the iTunes AAC encoder outputs a tad hotter than the source, there's some intersample overs that happen at that level that aren't detected on a typical peak meter, and all DACs respond differently. Something that won't be an over on your DAC may be an over on another playback unit. If you back it down to -.5 or even -1dB, the encode will sound a lot better and your listener probably won't be able to tell much of a difference anyway. b) Don't squash the master too hard. Masters with some dynamic range encode better. Masters that are squeezed to within an inch of their life don't. Simple as that. Listeners like it better too. c) Although the new encoder has a fantastic frequency response, sometimes rolling off a little of the extreme top end (16k and above) can help the encode as well. 5) "Mastered for iTunes" is only an indication that a hi-res master was supplied; it's not a separate product. There will always be only one version of the song on iTunes at the same price as before. "Mastered for iTunes" doesn't mean you get to charge more, or that iTunes charges you more. Everything is like it was before, you just supply a hi-res master so it sounds better. 6) So how do you supply that hi-res master? This is where it gets a bit tricky. If you're signed to a major label, they've been contacted my their Apple reps and everything is in place, so no problem there. If you're with an indie label, insist that they contact their Apple rep for instructions. If you use CD Baby or Tunecore, at the moment they'll tell you they don't take 24 bit or high sample rate masters. Insist that they contact their Apple rep and don't take no for an answer (this is what the Apple iTunes guy told us). Apple is greatly encouraging everyone to get with the program, so the more pressure you put on them, the quicker it will become a standard. Of course, if you can find out who your local Apple rep is (ask the local label), that could expedite things too. The bottom line is that "Mastered for iTunes" is a great thing for digital music. As far as I can see, there's no downside to it (except maybe for the initial hassle you may go through as an indie), and you'll be giving your fans a much better sounding product as a result.